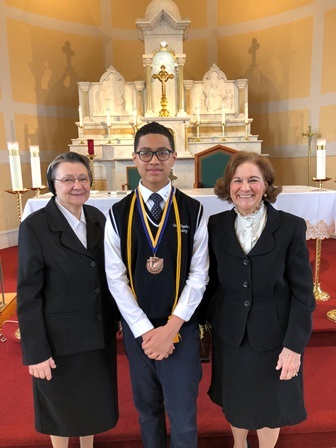 Jake Grullon has been chosen as GSA's Outstanding Catholic School Graduate of 2019. This award is given annually on one 8th grader from each Catholic elementary school in the Archdiocese of Newark. Christian works hard academically and exemplifies Catholic values in word and deed. 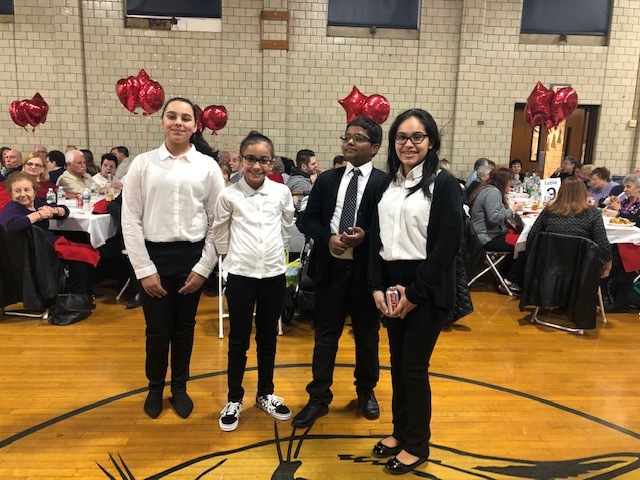 Congratulations to the following winners: Kaylen Subbian, 3rd grade; Abigail Tan, 1st grade; Kelli Mitchell, 4th grade for the Nicholas Maxim Award; Heather Gennette Budez Godoy, 4th grade; Amaya Vargas, 2nd grade. 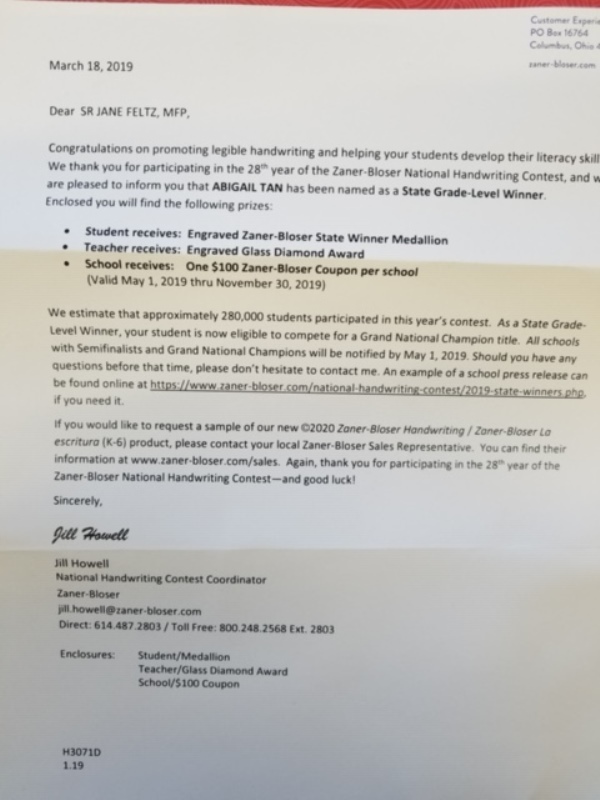 Abigail has also won the State Level and now continues to the National level competition. 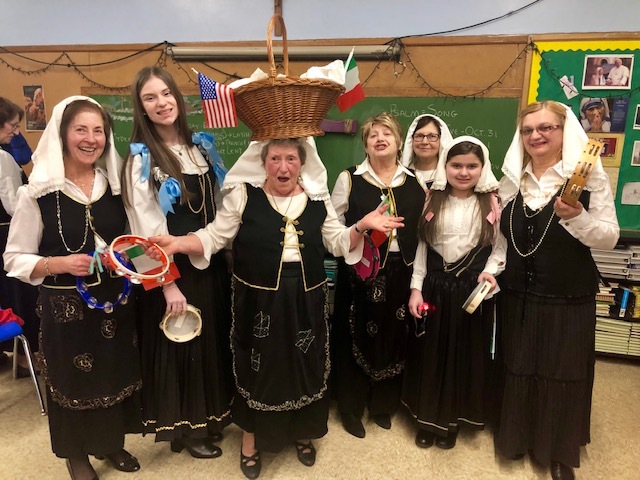 On March 23rd, many gathered to celebrate the 12th Annual Enrico Tamburri Memorial Fund Beefsteak Dinner. Mr. and Mrs. Tamburri are a great role model who continue to spread joy and to help so many in our community. A special thanks to the Jr Stewards and post Confirmation group who gathered to support this event. Selena and Sabrina Kossup have been attending this event for many years along with many Holy Family parishioners. This year they lead the cultural dessert presentation which is one of the highlights of the evening as wonderful homemade desserts are on parade before being set on tables to enjoy. Our Dance Program has been very successful since its start in 2016! Good Shepherd Academy students have the opportunity to join a wonderful program that builds friendships, strength, and discipline. This class introduces children in grades K-4 to Ballet and Jazz dance. The primary goal is to foster a love of movement and build self-confidence. Students learn proper dance technique as well as stage presence. If you love to dance and want to have some fun join the GSA dance Program! As we begin Lent, the children in Mrs. Boyer's Fourth Grade Class are doing Acts of Kindness. Some examples are helping their Families, being nice to those that need to be included, contribute to the Rice bowl. Pair and share with their classmates to work as a "team." They are very excited about this activity and they will enjoy their accomplishments. Some of their ideas will be displayed on our Bulletin Board outside our room. Eighth grader Jake Grullon is a recipient of the Sheehan Academic Scholarship and will be attending St. Peter's Prep in the Fall. The scholarship is awarded to the top 5% of the 800+ applicants this year. It covers the entire tuition for four years and funds participation in summer enrichment programs. Sheehan Scholars are selected based on the result of admissions exam, review of students' grades and through an interview process. Jake was also offered a place in the Seton Scholar Program and the Presidential Scholarship from Seton Hall Prep and Bergen Catholic, respectively. Congratulations Jake! 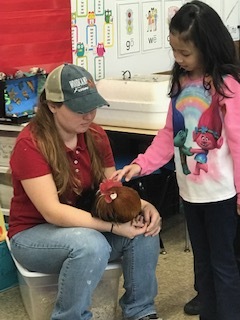 Yesterday Quiver farm delivered 12 eggs to both first grade classes. 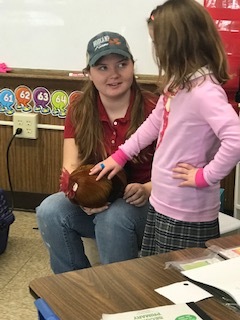 The students learned and got to meet a rooster (Tarzan) and hen (Jane). They learned the vocabulary for the incubator and the process of taking care of the eggs. If all goes well, there will be 24 baby chicks in the classrooms next week!! Watch a video as they learn about Groundhog Day. Click here. Learn why our Kindergarteners love grandparents and grandfriends. Click here. Open House - Opening Mass was held on Sunday, Jan. 27 to kick off Catholic Schools Week, followed by our Open House. Thank you to all the families who helped make our event successful. See Pictures. Spirit Day - Students in blue and gold, celebrated Spirit Day with fun games and activities. See Pictures. Mallory's Army - We welcomed Dianne Grossman and Mallory's Army to our school. This assembly was presented to our students in grades 5-8 in the afternoon and to our parents in the evening. The presentation was powerful and had an impact on both students and parents. The presentation eplained intention for good, gone bad, living a bracelet kind of life, and empowering the children to be the upstanders. Our students will leave kind words to their classmates on a Mallory's Army student designed bulletin board. See Pictures. Jeopardy - The students in grades 3 through 8 competed in a Jeopardy-like game show. The winner from grades 3-5 was Ysabelle Frum and from grades 6-8 was Anthony Tarczynski. A fun time was had by all and we are proud of our winners. Way to go, brainiacs! See Pictures. Grandfriends and Grandparents Day - GSA celebrates and pays tribute to grandparents/friends. They are a special gift in our lives and fill the world with love. We thank them for their support in everything we do. Thank you also to all the volunteers who helped us at the event. See Pictures. 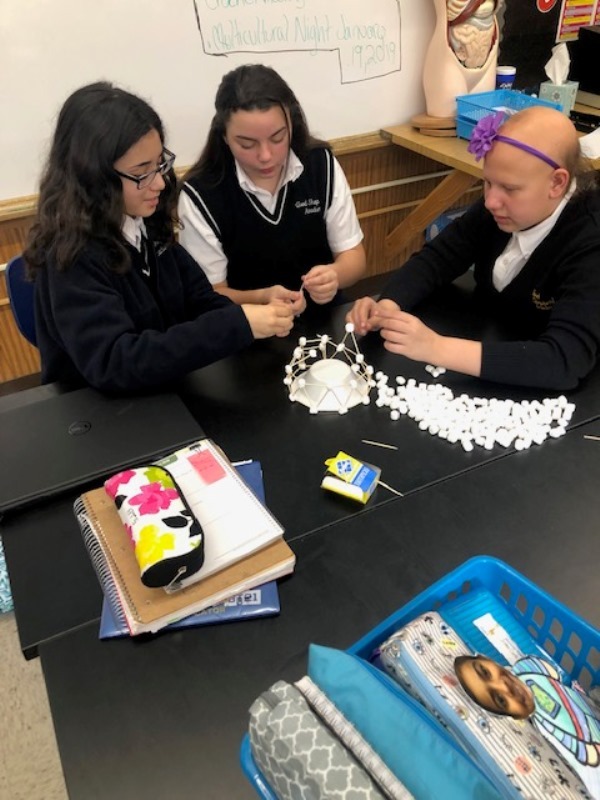 Mr. Jadran's 8th grade science class had a blast participating in the Igloo STEM Challenge this week! 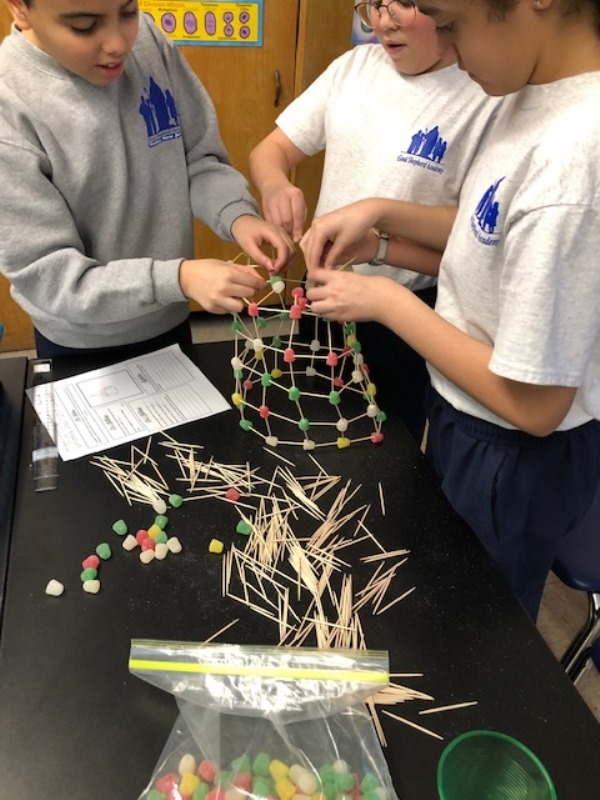 In this challenge, students had to build a dome shaped igloo model (with an opening to get in and out of) from only toothpicks and mini marshmallows. Students worked in groups and followed the engineering design process during this challenge: they made a plan and diagram before building, and then they built a prototype. After seeing what worked and what did not architecturally, students rebuilt their igloos and then reflected on the process. Click here for more Middle School Science pictures. 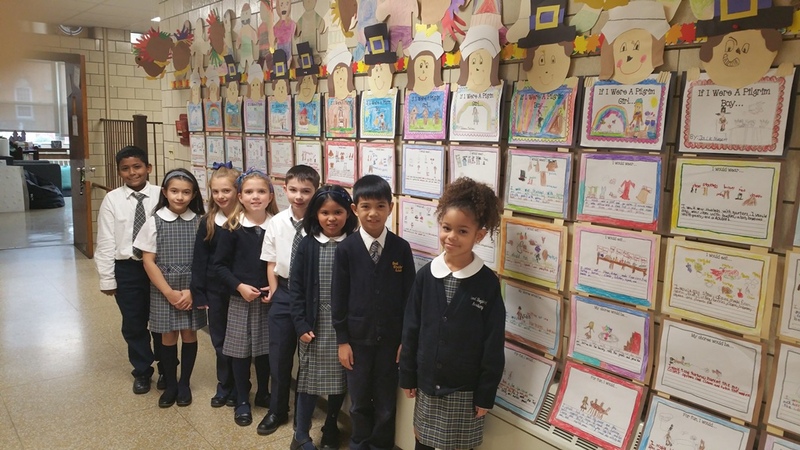 Once again the Fourth and Fifth Grades at Good Shepherd Academy participated in the annual coloring contest sponsored by the American Legion, Nutley Post 70. Alyssa Seecharran, a Fifth Grader, submitted our school's winning entry. Alyssa received a certificate and a $25 dollar gift card to Barnes and Nobel. S.T.E.M. is in high gear in the 3A classroom! The students constructed their own gingerbread houses making sure to use knowledge-based learning (in Science, Technology, Engineering, and Math). Once the creations were finished, they all enjoyed a delicious piece of their hard work. “It’s the Most Wonderful Time of the Year” in GSA’s Instructional/Media Center! The Computer Lab/Library hosted two important events last week that combined both fun and learning – The Scholastic Book Fair and “The 'Hour of Code™'! See photos of our students using props at the Enchanted Forest Book Fair to get into the spirit of the theme. The 'Hour of Code™' is a nationwide initiative by Computer Science Education Week [csedweek.org] and Code.org [code.org] to introduce millions of students to one hour of computer science and computer programming. Students from grades K – 8 enjoyed coding during their computer classes. It helps nurture problem-solving skills, logic, and creativity. Visit Photo Gallery for pictures. Mr. Jadran's 6th grade class had a blast acting as "engineers" while participating in the Christmas Tree STEM challenge! Students worked in teams to build a model of a Christmas tree using only gum drops and toothpicks. 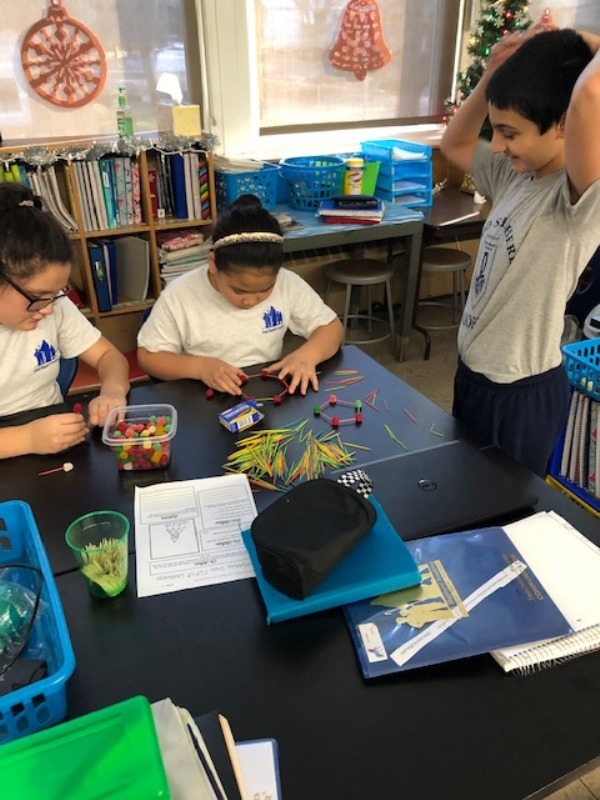 Prior to building their model, students had to draw a diagram of how they planned on constructing their tree, as well as estimate how many gum drops they thought they would use. To make the challenge interesting, the teams were given only 20 minutes to build their trees. After the building phase, each tree was tested on how it held up against wind (a blow dryer) and if it still stood tall with a star on top. Once the tests were complete, students reflected on the challenge, thinking about what worked, what went wrong, what they would do differently next time, and how their actual model differed from their plan. Aside from being a lot of fun, this challenge taught the students team work, as well as familiarizing them with the engineering design process! The 7th Grade Pre-Algebra Class is studying Geometry. 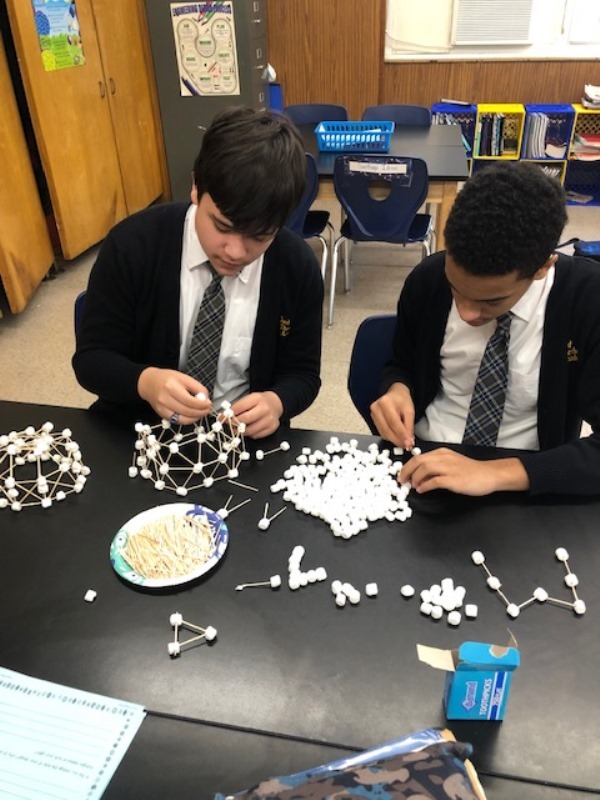 They are working on different modes of Tetrahedrons and Icosahedras. These are very symmetric and are called Platonic Solids. The Ancient Greeks knew there were only fine possibilities for regular solids and they thought this was a surprising and delightful property of solid geometry. There is no substitute for hands-on learning and holding the model in your hands. The students have done well in understanding something at High School level. They will now be studying finding area using symmetry. 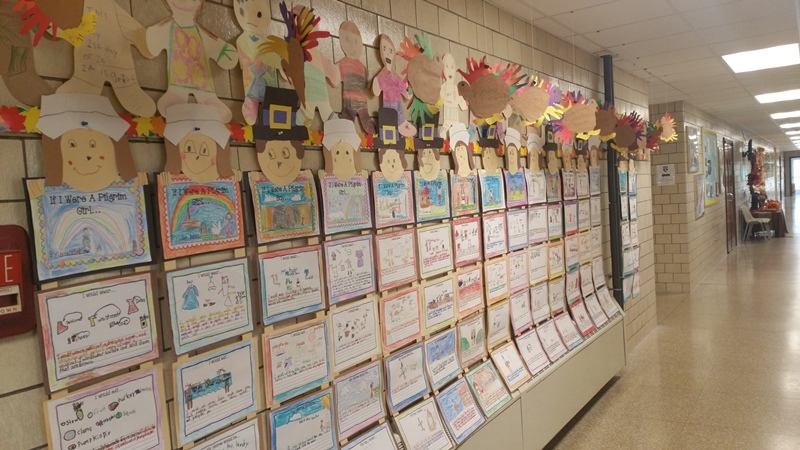 The second graders in Ms.Corneliess's and Mrs. Alfano's class learned many things about Pilgrim boys and girls and about the First Thanksgiving. They read books and viewed videos about Pilgrim life. Then they wrote and illustrated what Pilgrim children wore, ate, what their chores were and what they did for fun. Sumdog's Essex County Math Contest Results Are In! In total, 228 students participated throughout the county and answered 44,711 questions correctly. Some of our students from grades 2 – 5 competed on their own time and placed in the top spots in this contest! Congratulations to everyone on all your hard work! 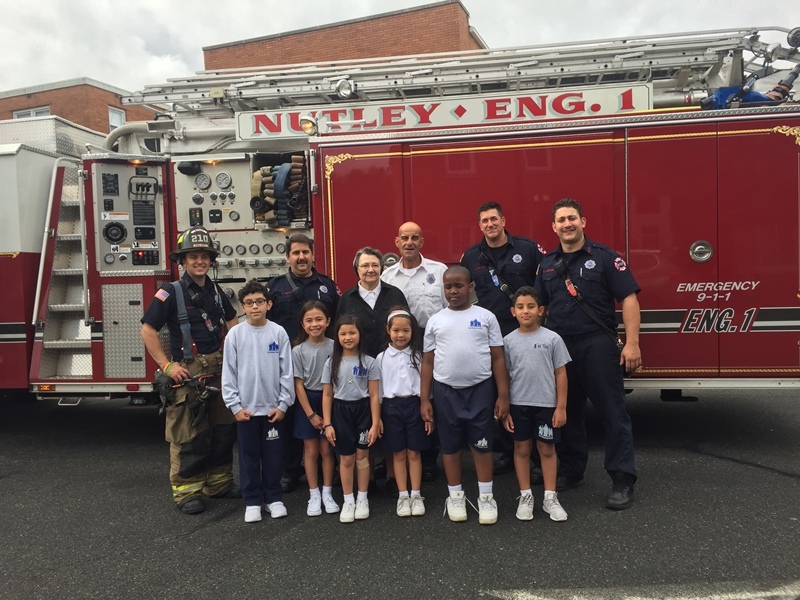 The Nutley fire department came to give us a demonstration of how they rescue people trapped from high places during a fire. The 8th grade started off the school year by diving back into scientific thinking with Mr. Jadran. The students worked together in small groups, following the steps of the scientific method as they conducted a "paper towel absorbency" experiment. Each group was given 3 brands of paper towel (bounty, Costco, and a dollar store brand). Without knowing which brand was which, the students had to OBSERVE each brand of paper towel and HYPOTHESIZE which brand would hold the most water. Using a dropper, they conducted three trials for accurate results. After carrying out the experiment, the students analyzed their data and made bar graphs displaying the results. The experiment was a simple yet fun way for the students to ease back into thinking scientifically after the summer vacation. The 6th graders participated in a "DNA Monster Mash-up" just in time for Halloween. The students have been learning about DNA, genetics, Punnett squares, and dominant and recessive traits in science class for the past few weeks. 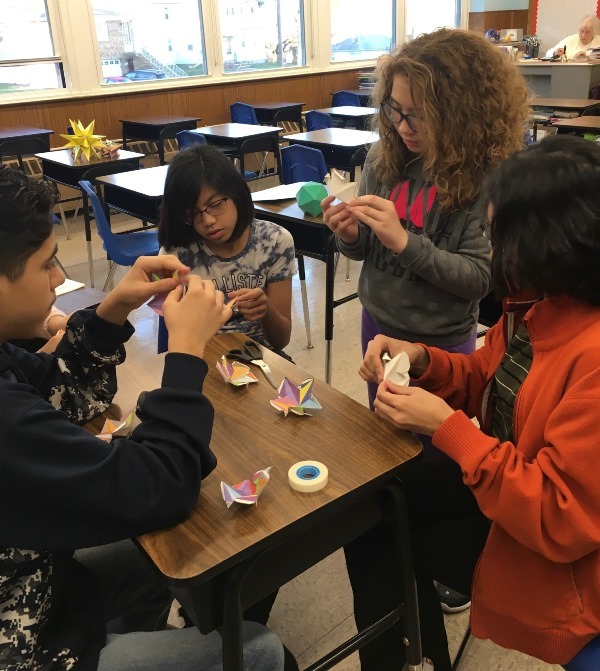 For this activity, Mr. Jadran's class combined what they have been learning with some creativity and fun. Students were given a chart with both dominant and recessive traits for their offspring monster, and they flipped coins to determine which traits both the mom and dad monster would have (example: round shaped monsters were dominant while triangular shaped were recessive). After figuring out the different traits, students put their science skills to the test and created Punnett squares to determine which traits would show in their offspring. Finally, they created their DNA monsters based off of the traits that would be shown. This was a great way for students to practice what they have been learning while also having a blast! On Friday, October 26, Mr. Jadran's 6th grade class participated in a fun science activity just in time for Halloween. Students inflated balloons using water bottles and specific amounts of baking soda and vinegar. The students were re-familiarized with the reason behind why baking soda and vinegar react (because of an acid-base reaction, baking soda being a bicarbonate and vinegar being an acetic acid). To add a Halloween aspect to the experiment, spooky faces were drawn onto the white balloons. 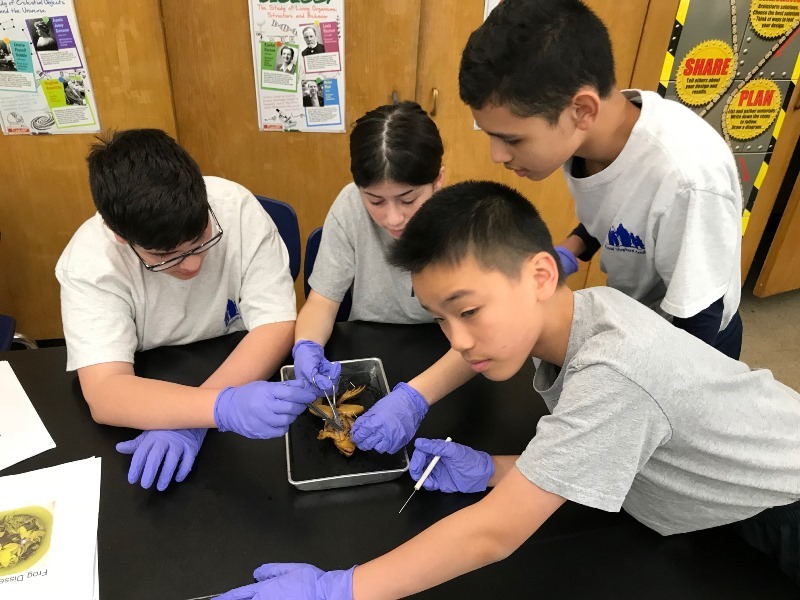 Click here to view Middle School Science pictures. First through third graders were treated to a wonderful presentation by Ms. Brandi Biehl and Erica from Sea Turtle Recovery on Monday, June 4th. This non-profit organization is dedicated to the rehabilitation, preservation and conservation of sea turtles and is located within Essex County's Turtle Back Zoo. The students had already been introduced to sea turtles via library books/classes and the after-school Science Explorers Club. The representatives from Sea Turtle Recovery showed a slide & video presentation and talked about the many ways in which they treat, release and protect sea turtles. They brought equipment to demonstrate how to measure turtles and how they tag them as well. The students and teachers also participated in a question and answer session. You can check out their website or make donations to their organization at seaturtlerecovery.org. Click here to view presentation pictures. Our annual STEM Fair was held on Wednesday, May 30 in the GSA gym. It was another huge success. Thank you to Mr. Pignataro for his hard work on this educational event. Congratulations to all the participants and winners! Visit our photo gallery for event pictures. 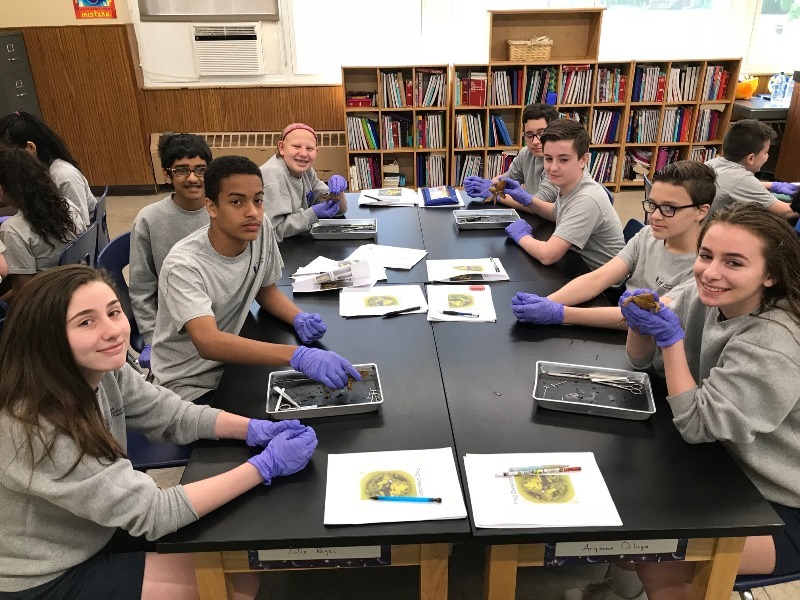 Our middle school students performed frog dissection today! The procedure gave a good overview of the organ systems of a complex living thing. There’s a magic that happens when you have the perfect combination of learning and doing – who wouldn’t remember the amazement of holding intestines while learning about what they do? Click here for more pictures. "Producers, consumers, decomposers, oh my!!" 3A put together an example of an environment containing "dirt", "worms", "grass", and "animals" -- all edible, of course!